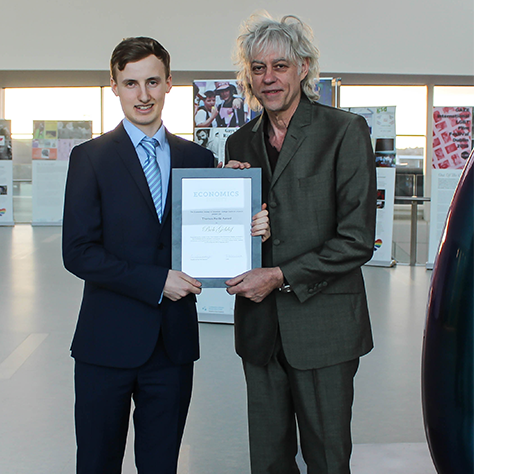 Kruger Cowne client Sir Bob Geldof was presented with the prestigious Thomas Kettle Award together with Honorary Life Membership of the Law Society by the UCD Economics and Law Societies last Thursday. Sir Bob Geldof addressed both Societies at University College Dublin, speaking at length about the need to disrupt mainstream consensus, and to engage and act on serious issues around the globe. He then took questions from the 200 students present, leading conversation which ranged in subject from the question of whether corruption may undermine the value of bilateral aid, to whether young people have failed in combatting the right-wing political campaigns of recent months. As a tireless campaigner for numerous good causes and charities throughout the world, Sir Bob is able to use his high profile to great effect. From African famines and aid organisations to business, global politics and communications, he has raised awareness of a wide range of causes which have led to a knighthood and receipt of the ‘Man of Peace’ title, recognising his “outstanding contribution to international social justice and peace”. Sir Bob has become a hugely successful public speaker, drawing on his vast experience to speak eloquently in an informative, provocative and entertaining way on a variety of topics.